The brain creates special dilemmas for journalists; what could matter more for human existence than the brain itself? Yet during this two-day workshop it came out that most of what we know about how it works is speculation. When the specialists don’t understand things, it leads us to focus on their disagreements, which satisfies only those who like fights. That focus on specificity made Saxe the foil to our speaker at the end of day one, Lisa Barrett Feldman. Feldman argued that the brain does not have specific spots that deal with emotions. Saxe almost immediately began talking about how the amygdala was the center of emotional salience. Saxe called herself sympathetic to ‘essentialism,’ in this context the idea that a part of the brain is essential to a certain function, as is her teacher and mentor, Nancy Kanwisher. (see some of her talks on the brain here), who spends her research times looking at specific things the brain does. In Saxe’s favor are some well-established aspects of the brain. We know that people who have suffered brain damage might lose just one function, the ability to use numbers, for instance. Saxe herself has been involved in research that places the right temporal parietal junction, the place just above the right ear where the right temporal and parietal lobes meet, as a source for theory of mind, our ability to recognize that we and others have minds (Saxe dubbed it “thinking about thoughts”). “It is just the weirdest idea,” Saxe said, that theory of mind would have a specific place in the brain. But after 15 years of trying to disprove this idea, she grudgingly accepts it, and speculates that either thinking about what other people are thinking was so evolutionarily important that a region of the brain developed for it, or that we spend so much time doing it that, as with reading, a part of the brain became dedicated to it. It seemed to me that both Feldman Barrett and Saxe could be right: emotions could trigger places across our brains, while specific things like eyesight and motor coordination are rooted in one place. It’s no surprise scholars disagree. Saxe told us how there’s heated debate in the academic world about why human three year olds usually fail the False Belief test, where we expect other people know what we know about an event, and why five year olds usually pass this test [here is a link to the portion of Saxe’s TED talk on the False Belief test, which she also showed us]. I will note, anecdotally, that people can continue to fail the False Belief test even as adults. Game theory banks on people developing false beliefs. My spouse and I often think the other knows what we know about some event involving the kids, for instance, but of course we do not. Clearly, something happens in the brain between three and five for us to develop a theory of mind. But Saxe said it is difficult for neuroscientists to test hypotheses about the neuro underpinnings of theory of mind, because three-year-olds can’t read and can’t lie still for the 15 or more minutes needed to make a usable brain scan. I liked a side path Saxe took about the crisis in FMRI. FMRI works by averaging the flow of blood across regions of the brain. It does not give you specific reads on a specific place in the brain. You could not look at a specific voxel, an area of about a 100,000 neurons. But then multivoxel analysis was developed, which let scientist look at the patterns in the brain more precisely. They could see differences in the patterns of blood flow activation in the brain. Saxe says this is giving a greater ability to see what is happening in the brain, and has salvaged FMRI technology. Even so, Saxe let slip that this stuff is just “better than chance,” which I found a weak base for drawing important conclusions. Still, it has led to a study she submitted just last month that showed we can use scanners as effectively as regular psychological tests to distinguish between justified and unjustified beliefs in young children, the first time that MVPA has been applied to kids, she claimed (in part because kids are so hard to scan). Saxe said it was the first study that features adolescents being scanned. Afterwards, some of the gathered journalists expressed skepticism that she’s actually been able to get adolescents to lay in a scanner without moving for the hour and a quarter she says she needed. But Saxe swears it’s true, showed an image of kids being trained in play scanners, and described her methods for getting them to lay still, including having a dog for them to pet and a person constantly in attendance. It will be interesting to see if someone can replicate this study. It should be easier to replicate the work of our second speaker on day two, Josh Hartshorne, a young cognitive psychologist now teaching at Boston College. Hartshorne uses massive online surveys to study how the brain develops over time, and he’s finding a different pattern than past research would suggest. Traditionally we expect to see a youthful peak across a wide range of brain functions and then a slow decline. That tradition is based on a slim set of data, most of which is not publicly available. Hartshorne says the new data suggests a different range. For some things, it is true that our processing speed peaks young and then declines. This is most pronounced for digit symbols and for arranging pictures, both of which are measures of how fast one thinks. We peak at names between 20 and 24 (I remember amusing myself at parties by showing how many names I could remember after having met them just once, and reaching well past a dozen. I no longer would do well at that game.). But for a similar task, remembering faces, our peak is older, at 30 to 31. That is an odd disparity, Hartshorne says. Odder still is vocabulary. We continue learning new words into our 40s, say some studies, and into our early 50s, say others. Hartshorne also talked about the Flynn effect – it surprised him that almost none of us knew what it was. Flynn noticed that IQ tests have to be renormed every 20 years or so, as average scores consistently rise above 100. Are we actually getting smarter generation by generation? Perhaps not – IQ tests measure only facets of intelligence. But obviously we get better at IQ tests. Some of that may reflect a culture becoming more scientific, since IQ tests measure what people need to be good at science, not general intellect. Hartshorne’s assertion that for several centuries western cultures have been moving more towards scientific thinking feels broadly correct, given the Enlightenment and its descendants, the Industrial and Information Revolutions. Even in the era of television, loathed by intellectuals for its passivity, we see a smartening. Hartshorne pointed to the seminal sitcom, I Love Lucy, which focused for 30 minutes on the development of one plot. There was no subplot , no other threads. Now we expect three to four plots in a 30-minute show (it could be that TV writers have just gotten better at reflecting what we’ve always been good at). One important thing the Flynn effect suggests: the brain can be trained, over time. That may mean that brain games might actually work to make our brains better. It also might bode well for the re-skilling we’re going to need as our existing jobs morph and disappear. At least, that’s the hope. As Hartshorne put it, “I can’t tell you the new theory, we don’t know. This is one of the most exciting times to be a scientist, when old paradigms fall apart and something’s coming and we don’t know what it is.” If he’s right, history books will point back. Hartshorne reminded us that the goal of scientists is not to be right, it’s to be less wrong. That is a good thing for journalist to keep in mind, but runs exactly counter to our typical story line, at least in technology journalism. After lunch is the worst time to speak, but our post-lunch speaker, Bobby Kasthuri, was such a showman nobody would fall asleep. He has been mapping the brain. To be specific, he has built a map of about 1 billionth of a mouse brain, a nanometer by a nanometer by a nanometer. Still, it’s a start, and some day that may help us understand a good deal more of the way the brain works. Kasthuri was endearingly outlandish. “We are post-genomic compared to animals,” he said, meaning we can grow and think of things that he said are surely beyond our genome. He said this was possibly also true for some other animals, potentially primates, that they share information beyond their genomic needs. “For us it seems to be more the rule than the exception. The vast majority of things we do in a day are probably not encoded in our genome,” Kasthuri said. A big thought. I mentioned this to another speaker later on, who thought it a silly thing for Kasthuri to say. But it was fun to hear and it kept us awake! Anyway, Kasthuri is probably more of a moralist than Kennedy. Kasthuri is mapping the brain because he thinks, like Freud, that anatomy is destiny. Freud, being Freud, was talking about our genitalia, but Kasthuri is more high-minded. Puns aside, the contention is if we understand the structure of the brain, it will tell us things about who we are and why we do what we do. He introduced us to Santiago Ramon y Cajal, “the Einstein of neuroanatomists.” Cajal was the first to show the brain was not one big cell but made up of many, many cells. Kasthuri thinks the brain prunes those cells radically over time, one reason why adult brains are so much less plastic than the brains of children. He argued that if he and his pre-teen daughter were dropped into a foreign culture, his daughter would adapt well, he would not. Kasthuri conjectured that once we can map the brain, we may find that the brains of schizophrenics don’t grow up in the same way as other brains, that they will look a good deal like youth brains. Children, he notes, have imaginary friends and hear voices in their heads, and no one calls them crazy. But right now, he says, we are pre-Copernican. We don’t have the instruments we need to prove our theories. And we need new instruments to navigate the brain, with its 100 trillion neurons and 1 quadrillion connections. That’s 10 times the stars in the Milky Way galaxy. By the way, the map of the brain he hopes to make will be 1 zettabyte, or 1 billion gigabytes of data. For comparison, through 1999, the sum of all information produced by humans was about .012 zettabytes. he’s hoping to start a brain observatory that anyone can apply to use, like astrophysicists and telescopes. 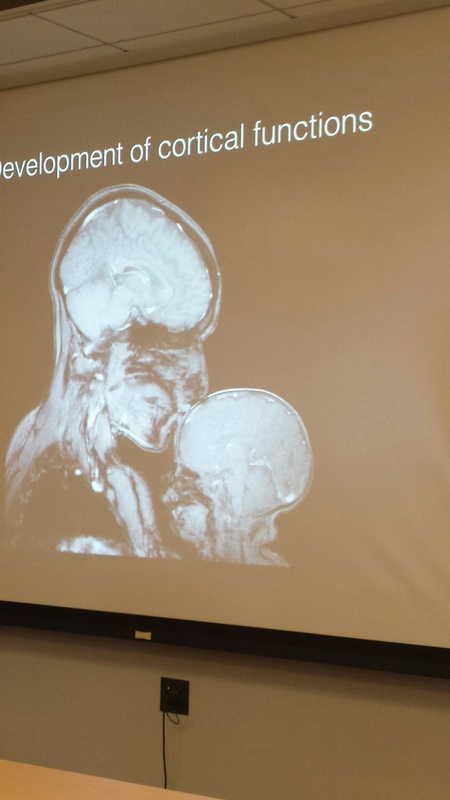 The final speaker was Van Wedeen, a Harvard radiologist. Wedeen says the structure of the brain is the least well understood part of the body. “The shoulder joint, the eyeball, the wing of a bird, have wonderful engineering explanations. For the brain it appears we almost don’t know where to start.” he said. Wedeen paid us the ultimate compliment of talking to us like we were advanced medical researchers. That meant a huge portion of his talk was above my head (a cliché, true, but it just means things couldn’t sink into my brain). Wedeen’s own work has shown that the brain has unexpected connections. We would think it would transmit things in waves. Instead, it sends information, signals, along interconnected grids. These grids should not share surfaces; they are three dimensional, yet his work shows they do share two dimensional surfaces. The rest I can’t really put in context; it is my challenge now to learn things like what he means when he talks about the orthogonal brain, and why humanity’s most important structure seems to communicate so improperly. The other thing I’m grappling with is how the brain is its own frontier, one we know almost less about than that supposedly final frontier, space. The brain in its way is the last bastion of individualism. Will some future Frederick Jackson Turner find that once we chart it, it hems us in? In 2011, I listened as an economist predicted massive downward pressure on housing prices, because of Baby Boomers retiring and downsizing. He expected to see McMansions split up into apartments or multiple generations of families living together again. Good for my kids, I thought. Maybe they’ll be able to afford a house. So far, Boomers have not found their housing nest egg cracked, and in some markets are seeing their houses become golden eggs. In some markets, cultural forces stronger than the Boomers seem to be at work. Cambridge has been an expensive place to live for as long as I’ve been in the Boston area. Walkable, but with a few good-sized shopping plazas, home to great and growing universities and a robust tech and biotech economy, people like the place and deal with its middling public schools. Real estate that’s expensive for what you get is normal in Cambridge. Over the long term such high-end immigration should boost local economy, creating new jobs and providing important sources of capital. Short term, it seems like a big part of the reason Boston real estate is so dear (though there also appears to be a development-stifling epidemic of NIMYBism, as this critique of Thomas Piketty’s Capital argues). For now, if you’re pitting the typical middle class mortgage holder against anyone with enough money to pay in cash, the cash offer is hard to turn down. What does it mean for a community? Over time, it becomes a city where people have a lot of money or they live in subsidized housing. Congress obviously doesn’t fret about a few urban real estate markets gone batty thanks to Chinese investors. Its immigration focus is on those poor people coming from south of the border. But poor immigrants are not squeezing the middle class. In Boston, poorer immigrants have their own real estate issues in places like East Boston and in Boston’s Chinatown). It’s the wealthy immigrants who seem to be squeezing us (more than 60 percent of us are feeling squeezed). In Miami, where I was reporting recently, I saw an immense luxury retail and condo complex going up in what was previously a lower middle class neighborhood. Miami is booming, thanks to wealthy immigrants, largely from South America. It’s great to see development — construction cranes mean people think a place has a future. But where are the construction sites for the displaced middle class? Isn’t that still a market worth investment? I interviewed Michael Rappa, the North Carolina State University computer science professor who created the first master’s in analytics program, back in 2007. He’s got more experience training data scientists than anybody else in academia, so I asked him whether companies have realistic expectations for the data scientists they hire. 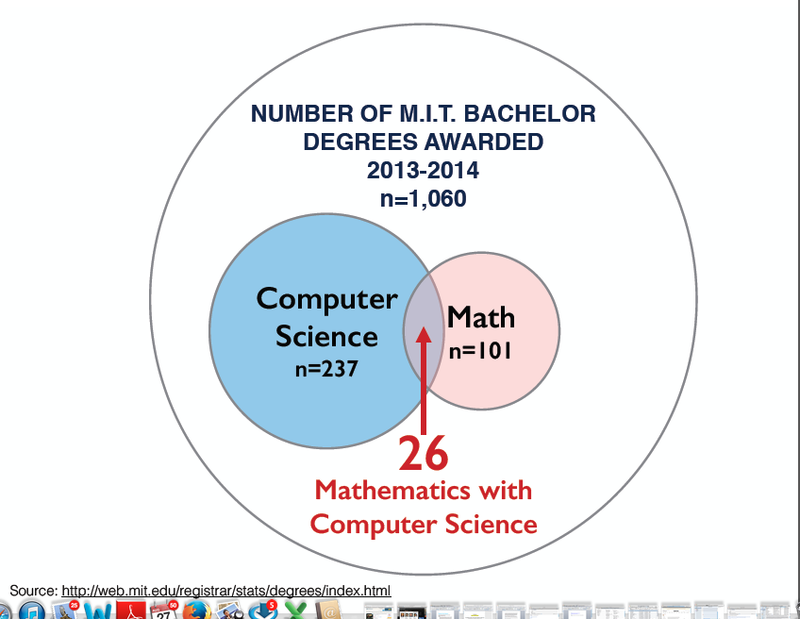 He said companies want data scientists to be strong at both programming and mathematics. Politics has a kind of magic to it; some man or woman emerges on a dais and makes pronouncements and they come to life. At least, these pronouncements get talked about as if they were alive, or could be, if the politician has the right kind of magic and can get other people to follow along. I was on the 5th floor of Boston City Hall one night last week, examining the Vermeerish trappings of Boston’s mayoral bureaucracy, the large desks, the high ceilings, the pictures and maps on the wall, the statue of the eagle that once graced City Hall, back before the hall of power became a transparent testament to the bare-knuckles nature of the city’s politics. I was there for a meeting of BostonNow, a quasi grassroots organization aiming to channel energy from the great Boston software tax revolt of 2013 into an ongoing force in Massachusetts politics. I’m interested in how ideas come to life, but I haven’t written much about political life and politicians. I’d never been to the 5th floor of Boston City Hall, was late due to delays on the T, and could not figure out where I was supposed to go for the meeting. Councilor Ayanna Pressley came sweeping along, also late for the meeting, and led me and a couple of other strays to where we needed to go. The speakers were from FWD.us, a Mark Zuckerberg/Bill Gates-backed group pushing for immigration reform, and the Mayor’s Office of New Urban Mechanics, a Tom Menino creation that has received praise for its creative use of technology (I wrote about it in Five Steps to Digitally Transforming City Government). New Mayor Marty Walsh kept the Urban Mechanics intact, and appears to be backing an expansion of its efforts (it is best known for fostering Citizens Connect, an app to report potholes and other city problems). The ritual is fascinating: people like Pressley and Walsh have to be in multiple places at the same time, and their schedules become rigidly choreographed so they can pull off this sleight-of-hand (more political magic). Sycophants show up to be seen, and the especially desperate will leap up and walk the politician to their car if they can (one man did that with Walsh). I liked that Walsh spoke without notes and without stumbles. Four minutes sounds short, but it is more than enough time to look out of touch, or worse. Walsh did not. I think of politicians in modern America as having a heroin-like relationship with money, but I didn’t actually sense this in listening to Walsh or the New Urban Mechanics. Nigel Jacobs, one of the co-directors of the Mechanics, said their job was to be “the risk aggregators” for innovative ideas, crossing the barriers of the various city departments to bring new civic innovation to life. What they wanted from the entrepreneurs present was ideas, and a little digital elbow grease. The New Urban Mechanics are, in effect, an API for the city. That’s a twist on politics. For another look at the evening, here’s BostInno’s piece on the event. Gearing up for a trip to Panama, I stopped by my bank to get some travelers’ checks. I haven’t used them for years, but Panama likes people to be carrying a fair amount of cash, $500 apiece, when they arrive (Panama uses the U.S. dollar). With four of us going, I figured travelers’ checks were a good idea. The woman at Bank of America told me they haven’t sold travelers checks for years, and asked me if I have a debit card. I do, though I consider traveler’s checks safer, in an odd way (harder to hack, at least). And indeed, travelers’ checks are in sharp decline and have been for more than a decade, according to Travelers checks sinking beneath a sea of plastic in the LA Times in 2000, though back then American Express still sold more than $23 billion worth of them. I can still get them from AAA, but I guess I’ll skip it. I’ve gone to Switzerland, the UK, Iceland, Germany and Ecuador in the last decade without getting them. Call me another nail in that financial instrument. They still feel like a better product — cash, but with protection. But there’s too much friction in the system. I’m going about this blogging thing all wrong. I was named to a swanky (if really long) list of media power players almost two weeks ago, and haven’t posted about it. I plead deadline distraction. I will now toot my own horn: I’m happy to be on the 2013 AlwaysOn Power Players in Technology Business Media, with all the rest of the remaining members of the Technology Business media. Wish I could’ve made last night’s dinner, but I had to teach. One quirk of reporting that the best stories you get when interviewing people often don’t fit the story you’re writing. I had that happen recently, as I reported a piece on the potential quantum computing cluster emerging in Waterloo, Ontario. Near the end of an interview with Raymond Laflamme, the director of the Institute for Quantum Computing, he started talking about the vibrant community in the Waterloo area, and how that helped him in recruiting. Little things like how he was able to circumvent Waterloo’s physician shortage because his doctor found out what he did, and told him to just send over any of his quantum team, and he’d see them. How 600 people show up for a theoretical physics lecture once a month. My favorite involves his meeting with the conductor of the Kitchener-Waterloo Symphony, who wanted to do something with the IQC. The two brainstormed and decided to do a quantum concert, or really the history of physics in music. “If you look at the history of science and music, they are concepts that seem to appear roughly at the same time, seem to be related,” Laflamme said. Newton, for instance, and Mozart were contemporaries. “They are well-defined, you can predict what’s going to happen.” But, when the 20th century arrives, music was in upheaval, and the same was true for science. Later, the randomness of quantum mechanics will emerge at about the same time as John Cage. Fun as it was, I couldn’t work it into a 750-word piece. So I’m writing it here. Anton Webern (1883 - 1945) / Transcribed by Gerard Schwarz, from an early work for string quartet. I don’t know quite about that last bit, with the reprisal of the Mozart and the Cage, only played simultaneously. I guess that’s quantum superpositioning, orchestra-style. Here’s a blog with some video of the concert. Laflamme told me as we were parting that when he was in high school, he’d been able to spend a day with Zenakis, and it was one of the highlights of his life. Gotta love that! We’re getting pretty close to having built an omniscient mind of our own, or so we think. The attachment of sensors to all sorts of things, billions of people feeding data to Facebook and Google and Apple, even more billions using cell phones that track our location, creating a treasure trove of data. Some — a select few — integrate and algorithmically analyze that data for patterns. All that data analysis points towards a depth and breadth of knowledge about people that we’ve not had before. Predictive analytics is what the field is called, because the algorithms let institutions make predictions about behavior – who will buy something, where a crime might be committed. We’ve had the ability to use data to predict things for 200 years; we now have more data and better algorithms, and can predict more things. People of all stripes know better than to pigeonhole their spouse. Many of those people will nonetheless prefer not to accept moral values. Market values may seem objective. But people make markets. Is it a good thing to replace morals with markets? The hacker as juvenile delinquent is an old meme. Hackers today are organized criminals, terrorists, government-sponsored agents of destruction. So it’s almost refreshing to read a piece where a hacker is just a bored teenager who doesn’t fit into the system. Almost refreshing because of course, he breaks things, or more specifically, into things. “Cosmo,” the subject of this Wired piece, is quite good at breaking into people’s online accounts. He’s not a technical whiz – he’s a social hacker, able to talk people at important technology companies into doing things like changing passwords on accounts, so his friends can take them over and wreck lives. In fact, Cosmo happened to help wreck the life of the article’s author. How much damage can today’s juvenile delinquent hackers do? With his group, UGNazi (short for “underground nazi” and pronounced “you-gee” not “uhg”), Cosmo took part in some of the most notorious hacks of the year. Throughout the winter and spring, they DDoS’ed all manner of government and financial sites, including NASDAQ, ca.gov, and CIA.gov, which they took down for a matter of hours in April. They bypassed Google two step, hijacked 4chan’s DNS and redirected it to their own Twitter feed, and repeatedly posted Mayor Michael Bloomberg’s address and Social Security number online. After breaking into one billing agency using social-engineering techniques this past May, they proceeded to dump some 500,000 credit card numbers online. Cosmo was the social engineer for the crew, a specialist in talking his way past security barriers. His arsenal of tricks held clever-yet-idiot-proof ways of getting into accounts on Amazon, Apple, AOL, PayPal, Best Buy, Buy.com, Live.com (think: Hotmail, Outlook, Xbox) and more. He can hijack phone numbers from AT&T, Sprint, T-Mobile and your local telco. Wired’s striving for cred means it liberally sprinkles in hacker jargon. Those who don’t make it their business to keep up with the tech crowd will have to sneak off to look up “lulz” (laughs) and other hacker terms (don’t know DDoS means an attack that prevents an Internet service provider from providing service? Tough). But readers should push through – it’s eye-opening to see what hackers can do to get at our data. Coincidentally, the most famous social hacker of all, Kevin Mitnick, has a new autobiography out. His exploits, while impressive, were far less destructive to random individuals. But there was much less data online when Mitnick was working, and the Internet was not yet a consumer medium. Things are different now. Cosmo’s story provides an inadvertent call-to-arms to consumers and businesses: take ownership of your data. At a minimum, find out what Netflix, Amazon and your online bank do to protect your passwords from the likes of Cosmo. Because while Cosmo seems to sincerely regret that he’s caused harm to the writer and others, the rest of his crew do not. There’s a strain of nihilism that runs through modern hacking, with none of the noble detachment of Turgenev’s seminal nihilist Bazarov. The Boston Globe today wrote about how the Isabella Stewart Gardner Museum had spent $184,000 for a new Steinway. I was scratching my head. Why would a Boston civic institution like the Gardner get a Steinway from Hamburg, Germany, when it could go up the road to Haverhill and support a local business, Mason & Hamlin? Plus, it would be bringing a bit of diversity to the Boston music scene, which like most places is dominated by Steinway pianos. M&H is known as the grand piano maker that doesn’t churn out Steinway clones. Picking an M&H piano would have made a civic statement, and perhaps brought some intrigue to the Gardner’s musical programs.